I have almost finished my homeschool plans for the coming year – just a few ends to tie up. I love to plan; the freshness of the new year stretches ahead & mirrors the blank canvas of my sheet of white planning paper. The adventures we will have! The things we shall learn together. I have used the ‘twelve squares’ method for several years now. I learned about it from the ever inspiring Melisa Neilson and she talks about it in her series of planning videos. 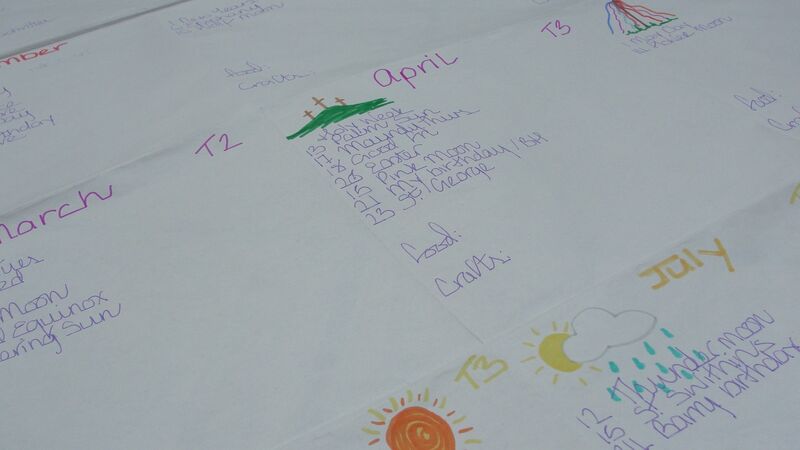 This year I have used a larger than usual piece of paper – flip chart size! I like it! It has room for all the extra notes that have been scrawled since these pictures were taken. I do not use my paper for my lesson planning. I record celebrations, festivals & special days we honour as a family, crafts I want us to create, seasonal recipes and nature notes. (The Elderflowers were jolly late this year!) I keep track of trips out and holidays; my lovely chart allows me to see the year as a whole and then break it down into it’s parts. A recent post from Carrie is a must-read if you are interested in this way of planning out your year. 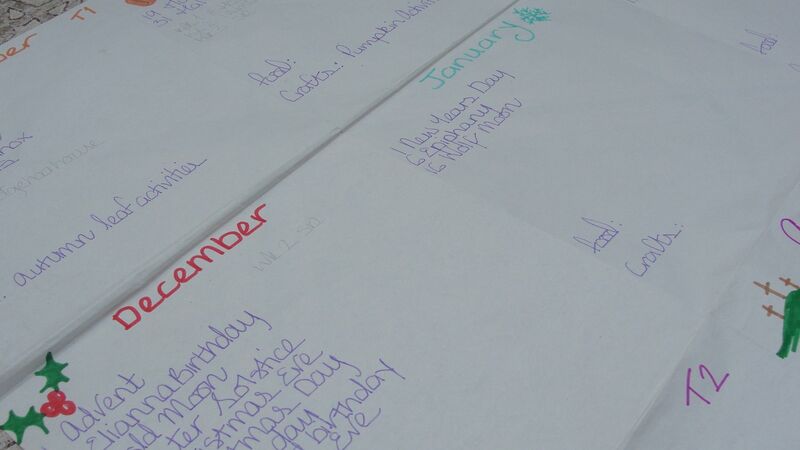 Planning this way helps me to see and find time for what is truly important to my family in each homeschooling year. Speaking for myself, if I do not plan for it to happen, then it tends not to get done. All the beautiful seasonal and Christian festivals would pass us by unmarked if I did not plan ahead and make time for them. I am too easily distracted by the ‘small things’ of life; but with my plan in place, I step out into the new year prepared. I’m so enjoying your lovely pictures! Everything is such a gorgeous green! Wish my family and I could be there with you and your girlies. The path reminds me of one close-by to our home, so it almost feels like I’m there with you. Hoping that one day we will take a walk together along that path.